When Helping Hands first met Cremelda, she was very ill. She had problems with her hearing, could barely walk, and experienced frequent tremors in her arms. During initial visits, Helping Hands gave Cremelda a walking aid, but eventually, she couldn’t use it due to the rapid deterioration of her health, including some paralysis. Once the illness was finally diagnosed and she began to receive the proper treatment, along with daily vitamins from Helping Hands, she began to show great improvement. 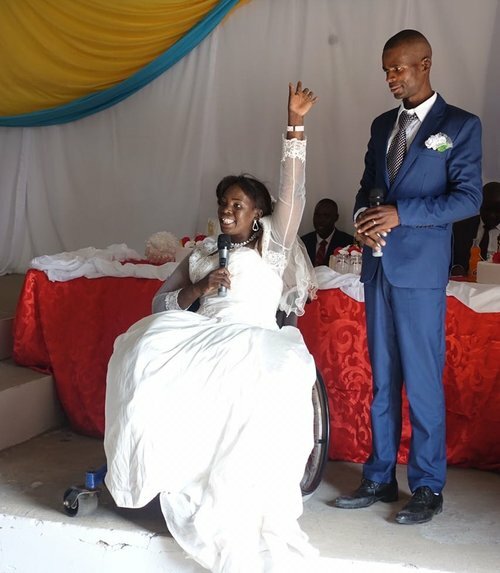 Cremelda soon expressed that one of her greatest wishes was to get married, but she would need a wheelchair for the special day. Her husband-to-be had stayed by her side throughout her sickness and challenges, even carrying her on his back to medical appointments when necessary. What a blessing to see her health improve and attend her wedding! In addition to receiving the practical gift of a wheelchair from the Helping Hands ministry, Cremelda and her family saw the power of God demonstrated through continual prayer and the outpouring of love and support from his people. Cremelda now loves to talk about God and share what he has done in her life. She gives him all the honor and praise for her life.